In 2013 we raised just under £3,000 and in 2015 we’re hoping the figure increases even more. As expected, this year Caketober has been bigger, better and full of more calories than ever before. Our Corporate Partners and other businesses, organisations and groups across Greater Manchester have got involved, tweeting us their #CakeFace on Twitter and dressing up, baking cake and paying for the privilege of eating their peers cakes too, we even gave it a go ourselves. 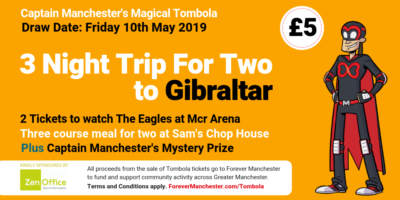 We’re currently still getting all of the money in and counting it up, so keep up to day on forevermanchester.com to find out the grand total. An extra special thank you goes to the staff at theEword, who for the second year running have helped out massively in the organisation, management and creation of Caketober.